Here is an example of typical Facebook nonsense. It may be time for term limits (or voters who do their job), but let’s use facts. None of the information below is accurate. The average income is closer to $51,000, there are 217 millionaires in Congress and the last time Congress had a raise was in 2009. 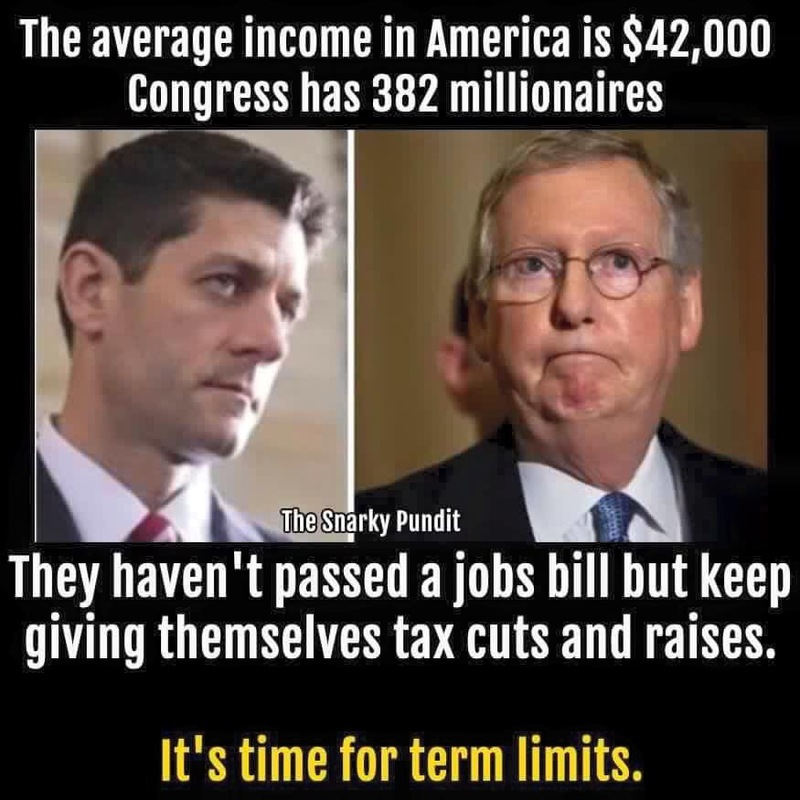 And by the way, the pay for Congress is way too low which is why there are so many rich people in Congress. In case you are interested, of the top ten wealthiest members of Congress, six are Democrats and four are Republicans. And about those tax cuts, well there aren’t any just for Congress and yes, any tax cuts tend to benefit the people who pay the most taxes, especially when 45% of Americans pay no federal income tax. They way Congress is running this government, they do NOT deserve a pay raise. They are still making more than 3 times what the average worker makes for working 52 weeks. Congress was in session just 157 days in 2015. Sure they have not had a pay raise since 2009, but they passed a $1,000 per month car lease bill in Dec, 2014 – I would call that a raise. Do you think that the reason 45% of tax payers do not pay any taxes is they are living in poverty or very close to it? Or, are one or two pay checks away from filling bankruptcy. With $19,644 per year income I pay zero Federal and only $136 to State and you are not going to get very much revenue from people making low incomes, anyway. Another questionable fact: Again and again it is reported in the media that agricultural usage accounts for 80% of the water used in “drought stricken” California”. I read this morning that a California Republican congressman, Nunes, states that the true number is 40%. I don’t know the real number. But it seems kind of important to know what it is. The person who posted doesn’t know the difference between median and mean.